Waterman (population 1,224) is located on U.S. Route 30 just west of Il. Route 23. This places Waterman about 12 miles south of Dekalb in the mid-southern portion of Dekalb County. The Burlington Northern Railroad runs through the center of town. The town was originally named Prairie Road after a post office was set up in 1860. The name of the town was changed to Waterman Station as it was set up along the newly formed Chicago & Iowa Railroad in 1871. The town was named after Daniel R. Waterman, who worked for the railroad. The name of the town was changed to simply "Waterman" in 1883. 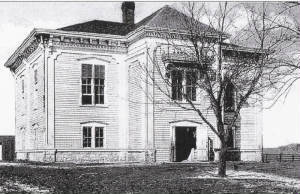 The history of the high school in Waterman is in need of further research. The roots of the school probably trace back to the early 1900s. 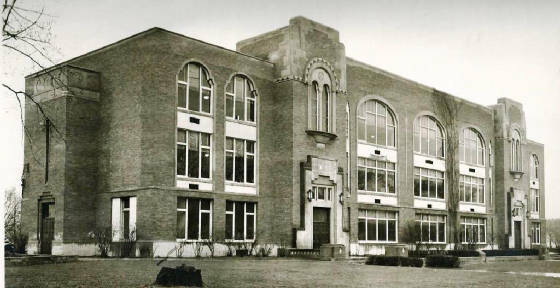 The high school was a staple in the community for several years. Based on information found on the IHSA web site (www.ihsa.org) a consolidation effort between Waterman and its neighbor to the west, Shabbona, became a reality in 1993. 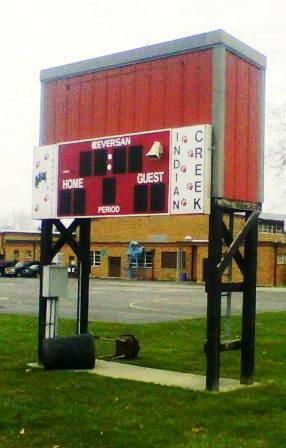 It was that summer that the two schools merged to form the Indian Creek School District. The Indian Creek High School is located in Shabbona. 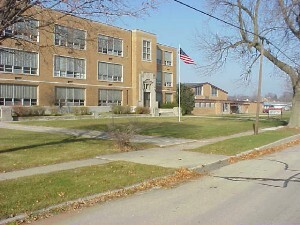 The Middle School and a Grade School are located in Waterman. An informative website regarding the Waterman museum can be viewed at http://www.rootsweb.com/~ildekalb/WatermanSoc.htm . School Fight Song: "Come On Waterman"
The Waterman Wolverines excelled in boys basketball and had individual medal winners in boys and girls track & field. There were some excellent soccer teams at WHS in the 1980s as well. It is probable other sports such as baseball for boys and basketball and softball for girls were offered. We are hopeful a knowledgeable person will provide us with this information. 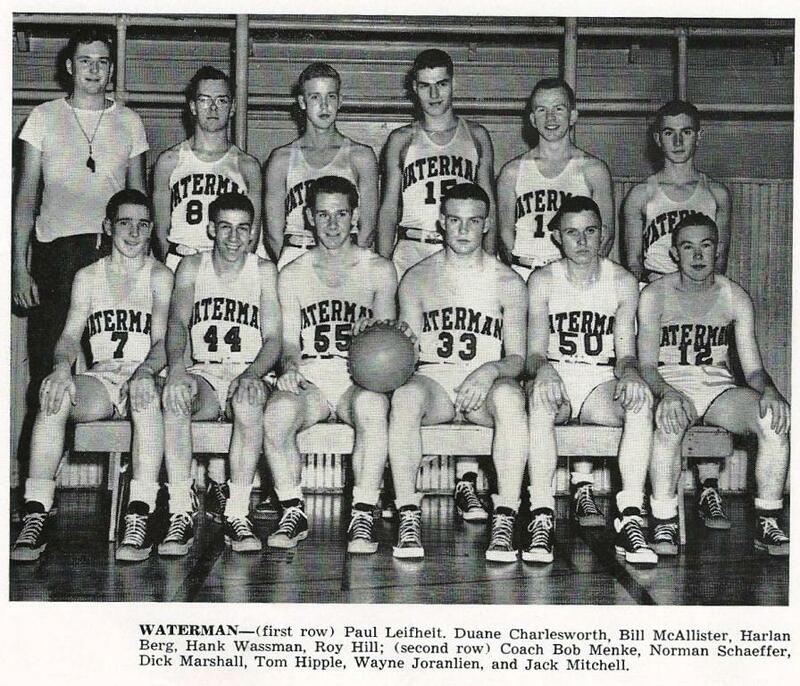 Waterman High School lays claim to a unique footnote in IHSA sports history. The first female Athletic Director for both boys and girls high school sports was assigned in Waterman. Ms. Peggy Adams served as AD for Waterman High School in 1979. She is now known as Dr. Peggy Jones. All of this under the old one-class system in Illinois! 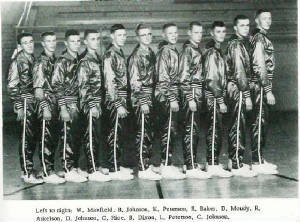 Two District titles were also won in the 1950s. Some scores from the annual IHSA Tournament were located on a website titled "Illinois Postseason Basketball Scores." These scores and season summaries (as best can be researched) are listed below. **This four overtime game is still an IHSA record for a state tournament game. **Waterman High School enrollment for this year was 85 students!. Harrison placed 3rd in IHSA finals. Morton lost in Elite 8 round. Lost to Berwyn-Cicero Morton HS 39 - 25. Morton eventually won the State Championship. Back Row, L to R: T. Baker, R. Hartman, W. Joranlien, Mr. Hartley, a. Seifert, D. Charlesworth, T. Leifhiet, Jr.
"The most memorable Basketball player I had the privilege to coach was Ron Shoger at Waterman High School during his Sophomore and Junior years. Ron was a talented ball player as well as a terrific coach and leader on the floor." **Final boys basketball game for Waterman High School. Became part of the Indian Creek High School District with Shabonna in the summer of 1993. 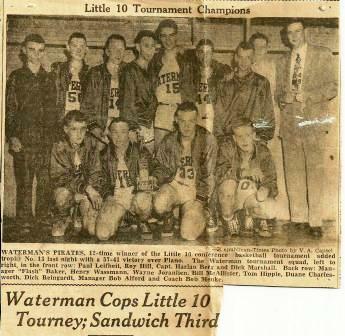 **Waterman High School at one time hosted their own Thanksgiving Tournament. A total of four medals were won by three different athletes from Waterman at the IHSA State Track Meet. These accomplishments are listed below. Two Lady Wolverines brought home a total of four medals which were earned by two athletes. In fact, one of the athletes, Patti Findlay, made four consecutive trips to the state meet earning three medals in the high jump! The accomplishments for the Lady Wolverines are listed below. The Waterman boys soccer team had some great seasons as well. The team of 1984-85 won the school's only Regional in this sport. Under the leadership of long-time coach Richard Townsend, the Waterman High soccer program was one of the best in the area, regardless of school size. Check out the credentials of the players and their coach below. Defeated Paw Paw 17 - 0 #6 all-time for goals in one game! "Waterman HS had Girls Basketball Teams: in 1905 Waterman HS beat Plano High School: 4-2. Seventy-five years later, in 1978, the PHS girls basketball team beat Waterman 75-12. This was the "first" girls BB team for Waterman...at least in the modern era." Linda Hess' research also discovered some scores from the Waterman High School football team that were played in 1925-1928. Conference historian Tom Sikorski provided the win-loss totals from these seasons. 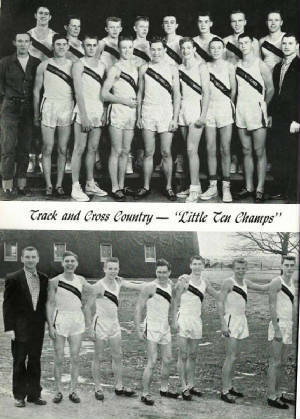 During various seasons the boys competed in Cross Country as well. 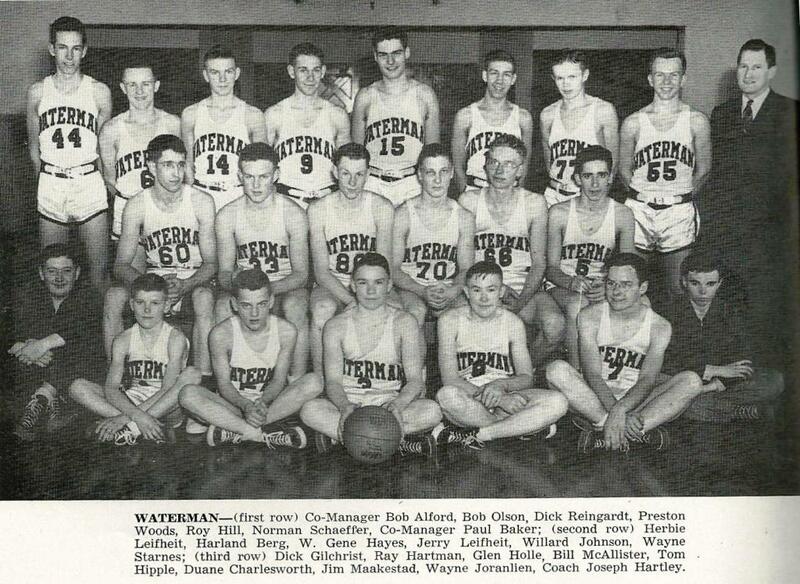 The Waterman High School boys competed in baseball as well. Some of the season records located in yearbooks are listed below. *Overall Boys Soccer record at Waterman - 210 - 93 - 31 !!! *Led Waterman to State in 1931 and later coached at Paris and Cisne, becoming the fourth all-time winningest coach in Illinois Boys Basketball history!! Had a career record of 779-175! Ernie was named one of the top 100 legends of IHSA basketball in 2006 - check out his bio at http://www.ihsa.org/initiatives/legends/index.htm. See information written at the bottom of this page. At four overtimes, this remains the longest game in tournament history. Duane Swanson went on to compete in AAU basketball and eventual played for the Universal Pictures AAU squad from California. At the 1936 Olympic trials Swanson's team won the trials' tournament and the 6' 02", 175 pound Duane Swanson was selected as a member fo the United States Olympic basketball squad. Swanson's squad the Gold Medal at the Olympic games that year! Was named All-Little Ten in his senior year in the 1939-40 season, in which he lead his team to the Little Ten conference tournament title. Then took his basketball talents to the University of Illinois. "He was the first player around this area and our conference to use a one-handed shot," said Serena guard Woodrow Hoxsey, who's Husker team defeated Waterman in the 1939-40 regular season to take that title. "With his height and his ability to shot from the outside, he was a tough player to defend." The early 1940s saw the era of the "Whiz Kids" at Illinois, a high-scoring, fast-breaking squad. 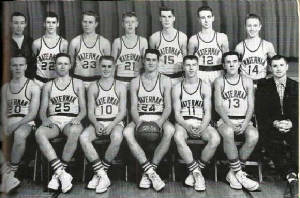 In 1942, the team won a Big Ten title with a team of four sophomores (one being Smiley) and a junior. Beating teams by an average margin of 24 points, the Fighting Illini would win the Conference championship again in 1943, losing only one nonconference game. That season Smiley was named to the All-Big Ten team. However, the "Kids" were not able to finish out their college careers as all were called to service in the armed forces immediately prior to the 1943 NCAA tournament. 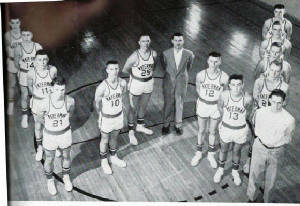 Smiley played and coached basketball professionaly, first with the Fort Wayne Pistons of the NBA in 1949. That season Smiley played in 59 games, averaging 6.7 points per game. The next year he split time between the Anderson Packers (12 games) and Waterloo Hawks (47 games, 6.6 ppg). He was also a player/coach for 27 games, earning a 11-16 record. He also returned later to coach basketball at Waterman, but his starting season and length of tenure is unknown at this time. 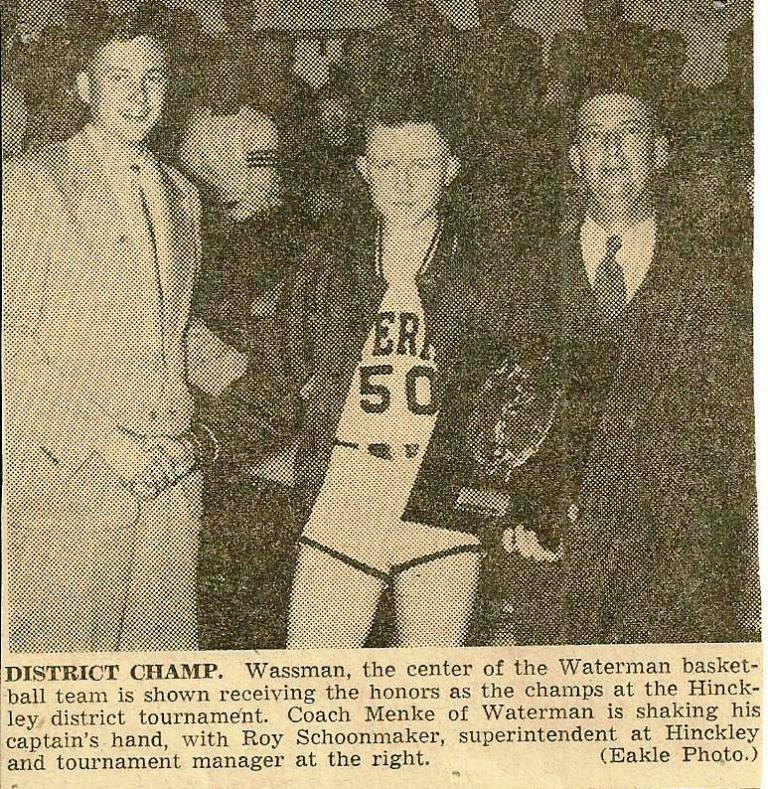 The following information on this Waterman basketball star of the mid-1960s was provided to us by Brian Hoxsey. Check out Brian's website on the history of Little Ten Conference at the web address of http://ltcbasketball.tripod.com/ . "In the great history of the Little Ten Conference there have been many great players, many with interesting stories. Ron Shoger would be one of those players. Shoger quickly made a name for himself in the 1965-66 season by leading the LTC in scoring as a sophomore, averaging 23.4 points per game. Waterman, under head coach Bernie Langheim, finished 10-12 overall and tied for third in the conference with a 7-2 record. Shoger was held under 20 points only four games all season was named to the first team All-LTC team. His junior year Waterman finished 20-7, 7-2 (2nd) in the LTC and he again was named All-LTC and led the league in scoring (24.2), but things would change for Shoger after that season. Ron played his senior year at Dekalb High School, helping lead them to a fourth place finish in the State Tournament. Ron continued his basketball career at Northwestern University in Evanston, starring there his junior and senior years. 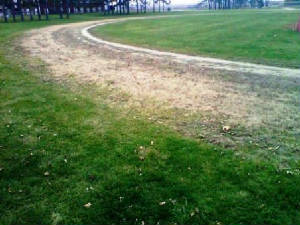 "I used to Coach at Waterman Junior High /High School. 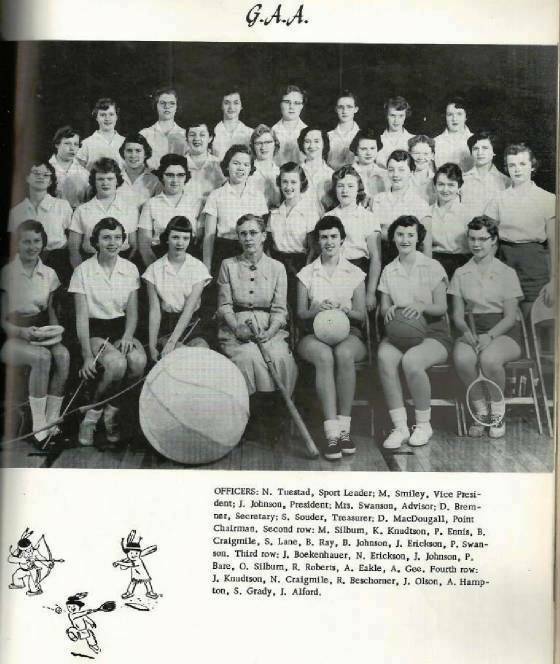 I taught there from 1974-1979 and coached soccer, volleyball, and track for junior high girls during the year of 1977-1979 — that is when they brought on sports for junior high girls. We had an undefeated girls soccer team in 1977-78 and I was very proud of all of the girls. I was also assigned as the first Athletic Director in the state of Illinois for both girls and boys sports in the spring of 1979, but then moved to Florida that fall. When I taught at Waterman, I was Miss Heenan and Mrs. Adams." 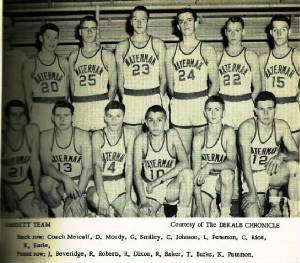 "He was an All-America basketball player for VU in 1949 and 1950, Bob Metcalf was described as "one of the greatest competitors ever to wear a Crusader uniform, an honor student, and a very hard worker." 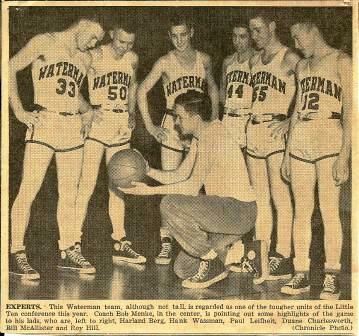 He coached basketball at three different Illinois high schools (including Waterman) from 1950 until 1980, compiling a record of 426-269. 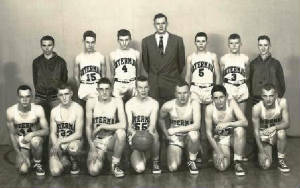 Metcalf's teams won 24 of 29 tournament championships and 31 total championships. Since 1980, Metcalf spends time in China, Mongolia, Indonesia and Sudan where he trains basketball coaches and players. He is the recipient of many awards for his coaching successes, the most recent being his induction into the National High School Athletic Coaches Hall of Fame." "Dr. Robert Metcalf graduated with distinction as an honor student from Valparaiso University with a Bachelor of Science Degree in Physical Education and triple majors in chemistry, history, and mathematics. He was inducted into the Valparaiso University Athletic Hall of Fame and as a team member to the Indiana Basketball Hall of Fame. Valparaiso has been identified as “a college that encourages character development.” At least in Metcalf’s case, that certainly seems to be true. Metcalf is a high caliber individual who has given tremendously to University High School. He first joined the school in 1961 as director of athletics and assistant professor of health and physical education. He retired from the directorship a professor in 1982. During his tenure, Metcalf’s coaching accomplishments include taking the boy’s basketball team to the Sweet 16 four times and under his leadership the 1971 team was inducted into the Illinois Coaches Association (ICA) Basketball Hall of Fame. Metcalf himself is also a member of the ICA Basketball Hall of Fame and the National High School Athletic Coaches Association (NHSACA) Hall of Fame. He ended 18 years of coaching the boy’s basketball team with a 254-168 record. Eleven years after retirement, Metcalf came back to U-High and served as a consultant to the boy’s basketball team for 14 years. While Metcalf was the boy’s head golf coach, the Pioneers took 26 championships, held second place in the State twice and won the State Championship once. He was named ICA Golf Coach of the Year twice and named NHSACA District Golf Coach of the Year. Metcalf also was inducted into the ICA Golf Hall of Fame, making him the first coach in the State to be in both basketball and golf ICA Hall of Fames. In addition to his involvement with boy’s basketball and golf, Metcalf started the boy’s cross country and the girl’s golf programs at U-High. He served as head coach for both programs two and three years, respectively. He also served as the girl’s assistant basketball coach for eight years after he retired. Since his retirement, Metcalf has been very active teaching and coaching basketball around the world. With over 11 trips to China, Metcalf has lived in the country the equivalent of more than three years. He has taught over 1,000 Chinese coaches in both national and provincial workshops. He has coached seven national-leveled Chinese – the first American coach in China to do so. His high school team won the Chinese National Championship in 1987. He trained two college teams to Chinese national championships in 1993 and 1994. Metcalf has also coached national and professional teams in Mongolia, Indonesia, Sudan, and Hong Kong. He has written extensively on basketball and shooting fundamentals. In 1985, Metcalf co-founded the Drug Enforcement Agency/National High School Coaches Association Drug Prevention Seminar. He revises the materials for the Association annually and is still their seminar director. He is also founder, chairperson, and co-organizer of the ICA/Bloomington-Normal Shrine Club annual high school all-star football game, which in its first ten years raised over $200,000 for Shriner Hospitals. In recognition of his local, national, and international impact on basketball, Metcalf has received the NHSACA’s National Distinguished Service Award, The NHSACA’s Dwight T. Keith Award, the NHSACA’s National Citation Award, and the Illinois Coaches Basketball Association’s Buzzy O’Connor Outstanding Service Award.